Come and work with us on digital preservation! The Bodleian Libraries and Cambridge University Library have received substantial funding from the Polonsky Foundation to appoint six Polonsky Digital Preservation Fellows for a joint two-year project. Three Fellows will be based at each institution, and will work collaboratively to address the development of systems and services to support the long-term preservation of the libraries’ digitized and born-digital cultural heritage collections. The roles of the three Fellows will be mirrored at each location, and will concentrate on the areas of Policy and Planning; Outreach and Training; and Technical. These six posts offer an exciting opportunity to help shape the digital preservation activities at two of the world’s foremost research libraries, and to share with others the knowledge and experience learned. For more information and details of how to apply, see http://www.bodleian.ox.ac.uk/about-us/jobs or http://www.lib.cam.ac.uk/job. 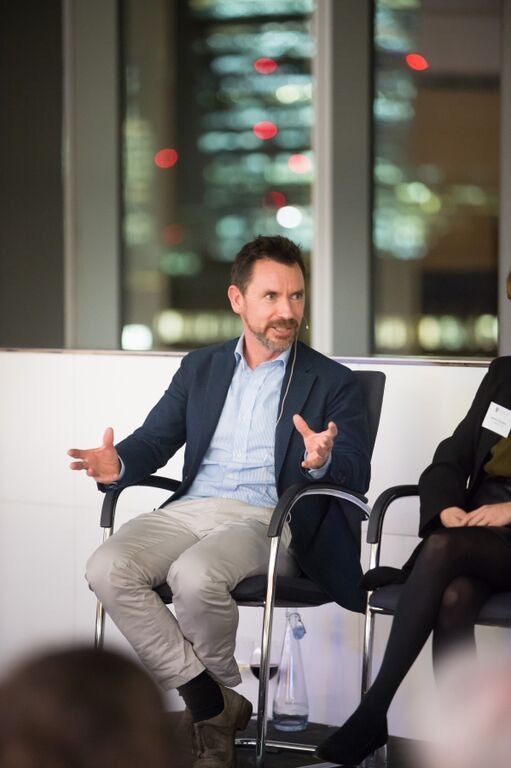 Ada Lovelace’s significant contributions were celebrated and discussed at the Ada Lovelace Symposium last week, marking the bicentennial of her birth on 10 December 1815. Lovelace brought important early insights into mathematics and computation, especially in the context of the Analytical Engine proposed by her collaborator Charles Babbage. She also brought her vision and computational intuitions to music, asking whether “the engine might compose elaborate and scientific pieces of music of any degree of complexity or extent”. On 30 November we explored mathematics, computation, and music through a performance of ‘Ada sketches‘, a short operatic work by composed by Emily Howard and part of her Lovelace Trilogy. More than a performance, this event with Emily Howard and musicians from the Royal Northern College of Music involved mathematical explanation and engaged the audience in composition, turning numbers into notes. We revisited this work at the Ada Lovelace Symposium through an interactive display and a conversation on stage between David De Roure and Emily Howard, herself a mathematician, computer scientist and musician. This also featured an extract of Howard’s work ‘Mesmerism’, another part of the Trilogy, and illustrated numbers and notes by generating a number sequence on a simulator of the Analytical Engine and developing the output as a musical theme—an exercise inspired by discussions at a music hack day held at Goldsmiths in October. The evening saw world premières of ‘An algorithmic study on ADA’ and ‘ADA’, composed by James Whitbourn, performed by mixed-voice contemporary choir with violin and harp. 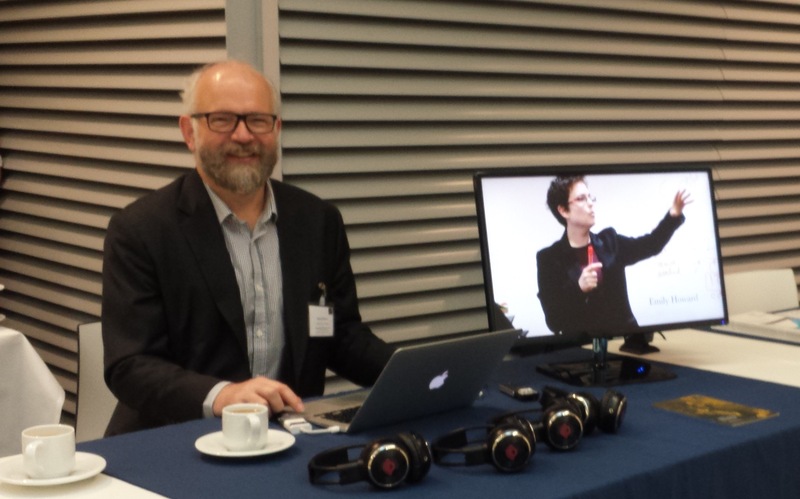 The event was supported by digital music research projects Transforming Musicology (AHRC, led by Goldsmiths, University of London) and “FAST” (EPSRC, led by Queen Mary University of London), and organized at University of Oxford by a partnership of the e-Research Centre, Centre for Digital Scholarship, and The Oxford Research Centre for the Humanities, in collaboration with symposium organizer Professor Ursula Martin, the Mathematical Institute, and Department of Computer Science. The performance was supported by the Royal Northern College of Music, Leverhulme Trust and University of Liverpool. agile-ox at the University’s Environmental Change Institute invites you to a hackathon! 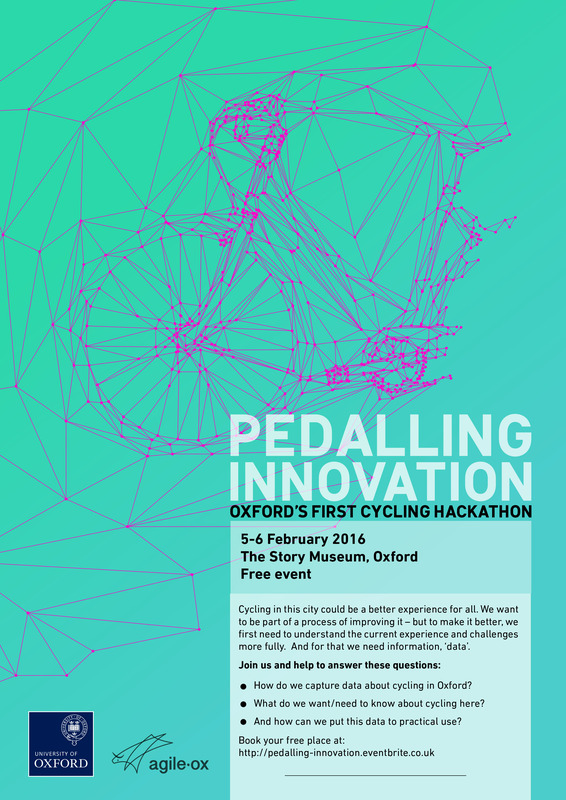 Come and join us at ‘Pedalling Innovation: Oxford’s first cycle data hackathon’, at the Story Museum in Central Oxford, 5-6 February 2016. What do we want/need to know about cycling in Oxford? How can we capture the information that we need? And how can we put this data to practical use? You don’t need to know about data or hackathons and you don’t need to know about cycling – everyone is welcome, and the more creativity the better. This free event will run from the Friday evening through to Saturday evening, and should be great fun. See http://pedalling-innovation.evenbrite.co.uk to sign up. Please circulate news of this event as far and wide as you can – and not just to cyclists. You can download a flyer for this event. Bring your creativity and enthusiasm, and let’s find ways to make cycling in this city great. Are you a R user interested in creating interactive visualizations and hosting them online? The Shiny package and service provided by RStudio allows interactive web applications to be created with only knowledge of the R language. There’s a free tier of Shiny that allows users to deploy content that can be used for a maximum of 10h per month, which can easily be used up if you build something that goes viral. There’s a project in IT Services that’s funding a Professional Shiny account through to at least March 2017, as well as providing support and assistance in creating Shiny apps—if you’re interested in using this service then email martin.hadley@it.ox.ac.uk for more details. If you have existing Shiny apps that you’d like to move to the service then we’d be very happy to help. The project is called Live Data and has been funded with the intention of making visualisation available as a service to academics, using a variety of tools including Shiny and other cloud-based visualisation tools. We organise termly meetings for researchers interested in data visualization ideas and tools to meet. The use of data capture and visualisation technologies has grown dramatically, embracing the needs of researchers, stakeholder communities, cultural resource managers, tourists and the general public. This paper previews the types of techniques being used by Australian archaeologists and collaborators in a range of study areas. The digital acquisition and visualisation of archaeological sites using photographic techniques (hardware and software), 3D reconstruction, laser scanning and other methods, along with novel methods for presentation provide us with opportunities not available even 5 years ago. The challenge for researchers is to maintain the theoretical impetus in the face of a plethora of new technologies and opportunities. Methods to enhance recording and to facilitate research methodologies are explored and the potentials for cultural resource managers and stakeholder communities to manage their heritage (e.g. with tourists in interpretive displays, websites and other virtual media) are highlighted. Professor Alistair Paterson is an archaeologist at the University of Western Australia where he has been Head of the School of Social Sciences (2013-15) and Archaeology Discipline Chair (2010-2012). He is currently a visiting researcher at the Institute of Archaeology, University of Oxford. His research and teaching covers culture contact, historical archaeology in maritime and terrestrial settings, European colonization, historical rock art, digital scholarship, and archaeological and historical methodology. Much of his work is located in Western Australia and the Indian Ocean exploring the uses of coast and offshore islands in colonial and pre-colonial settings, and early colonial settlements across the state (in collaboration with the Western Australian Museum, iVec@UWA). Members of the BDLSS Research Data Management team have been working with colleagues in IT Services to produce a version of Data Management Plans Online which is tailored specifically for Oxford researchers. The DMP Online is a free web-based service from the Digital Curation Centre (DCC) which enables researchers to create a Data Management Plan (DMP) for their research project. Users of the service have previously been able to view guidance from their appropriate funding body and/or the DCC, but anyone creating a plan and specifying the University of Oxford as their institution will now see further guidance which directs them to a range of Oxford services and information sources that will be of use in producing DMPs for Oxford research projects. The Oxford Research Archive for Data (ORA-Data), which is managed by BDLSS on behalf of the University, has been awarded the Data Seal of Approval. 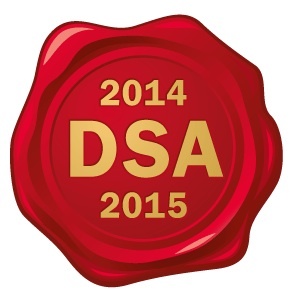 The Seal represents an international, peer-reviewed standard which certifies a data archive according to sixteen essential criteria for good practice, thereby providing evidence of compliance with key Research Data Management (RDM) principles and denoting the archive as a “Trusted Digital Repository“. ORCID is rapidly becoming the de facto author identifier so that authors have their work attributed and also so that over time research administrative burden is reduced and improved. ORCID is increasingly becoming the method of choice by funders and publishers globally to unambiguously link people to their publications and grants. Already Wellcome Trust requires that award applicants have an ORCID. The numbers of Oxford scholarly authors obtaining and linking their ORCIDs to Oxford is growing steadily. The number of Oxford linked ORCIDs currently (3 December 2015) stands at over 2,100. As more services, publishers, and funders adopt ORCIDs and more authors use them, Oxford authors will see further benefits of having an ORCID. Bodleian Digital Library is delighted to announce that it will be running an ORCID implementation scoping study (January – April 2016) to define how ORCIDs should be used across the University within diverse systems such as Symplectic, ORA, systems in IT Services, PRAS, and other relevant systems. Please encourage Oxford researchers to obtain and link their ORCID. For more information about ORCIDs at Oxford see http://libguides.bodleian.ox.ac.uk/ORCID.